I survived the night in my damp sleeping bag. I had all my thermals on to help protect me from the cold. I woke early. The sun was shining by 6am. But it was very chilly. We cycled the road today through Slovakia countryside. Traffic was light, so it wasn’t bad. After about 60 km we reached the border with Hungary at Sturava/Esztergom. There was a very nice church overlooking the Danube on the Hungarian side. Come 4 o’clock we got an impressive sight of the Hungarian parliament before crossing the bridge into Budapest. Was going to get a hostel. But we got touted and have ended up in a nice apartment in an old building between the British Embassy and the Belarus Embassy right in the Centre. Went for a decent walk heading out of the city and found a nice local place to eat good Hungarian food. Spent the morning on the internet and then headed to the mineral baths for some deep cleansing and a bit of relaxation. 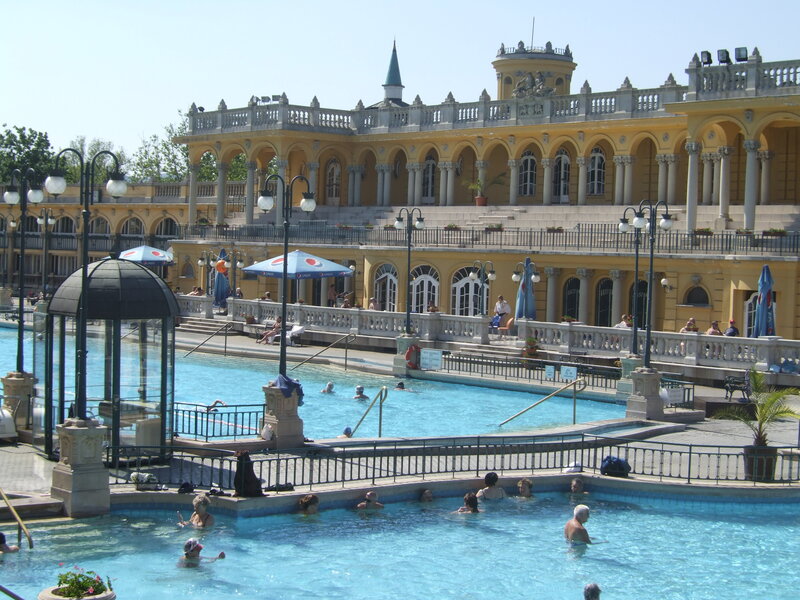 The baths are in a lovely old building and there are lots of different pools with temperatures ranging from 16 – 40 degrees. I made the mistake of getting in the 16 degree pool. It was just freezing. In some pools people were playing chess. There were also heated pools outside with lots of fountains and a wave machine that pulled you round in a circle. I also spent a bit of time in the sauna. It was a great day doing little and archiving a lot. After 4 days travelling together, Jeremy and I went our separate ways for now. 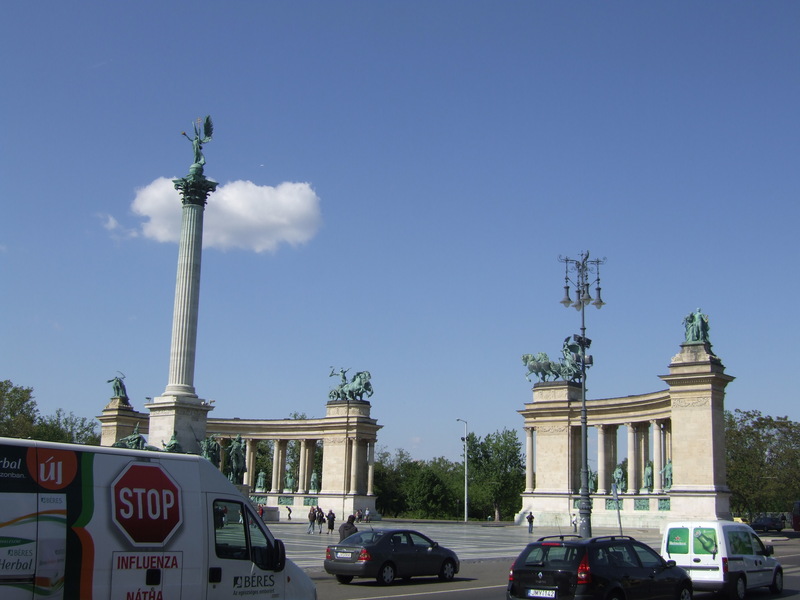 I am taking a more direct route of road 5 to Belgrade (Serbia) while Jeremy will continue to follow the Danube. It is 370 km to Belgrade and I will try and do it in 3 days. Though 4 days is more likely. Route 5 turned out to be a pig. There was no hard shoulder and lots of no cycling signs………..I didn’t have much option and went any way. Saw a few police and they didn’t seem to care. The traffic was good. No one beeped at me because they may have thought I shouldn’t be there and gave me plenty of room. 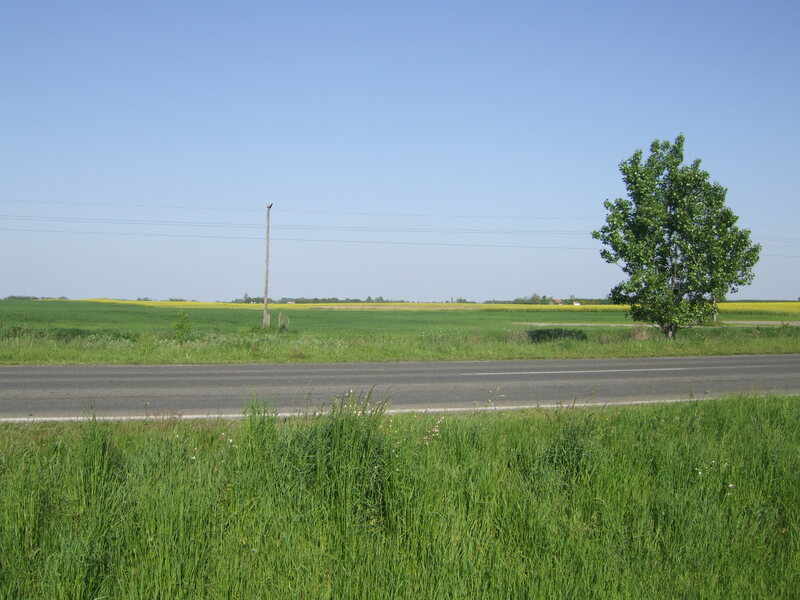 It was nice cycling out in to rural Hungary on a nice sunny day passing in and out of the little villages. After 4 hours I had done 80 km and saw a sign for a campsite. So I thought I might have an early day as I still had some things to do like cleaning the bike after the day in the rain because it is filthy. Change of plan when I discovered the campsite was closed. Decided I would crack on till about 7 pm and then just wild camp somewhere. So at about 4 pm I stopped at the supermarket to stock up on food and headed out of Kiskunteiegyhaza with the next goal being Szeged a good 75 km away. About 15 km out of Kiskunteiegyhaza I had a car pull over in front of me and a woman got out. She said her and her husband were setting up a guest house and I was more than welcome to come and stay. I didn’t think twice. The guest house was great. Very primitive old farm house with a thatched roof in a very nice setting. I camped on the lawn by the barn. Looking out over many wet lands full of birds such as storks and hawks, frogs and other wild life (deer). It was beautiful. The houses were owned by Expats Annemike and her daughter Nathalie originally from the Netherlands and Jay originally from England. We had a lovely dinner outside with an open fire and good conversation. That evening the stars were so clear to look at………..I slept well after a long day. I awoke this morning and could feel the heat on the tent. Annemike prepared a lovely breakfast and we sat out in the sun chatting. It was so nice I didn’t really feel like cycling anywhere in a hurry. 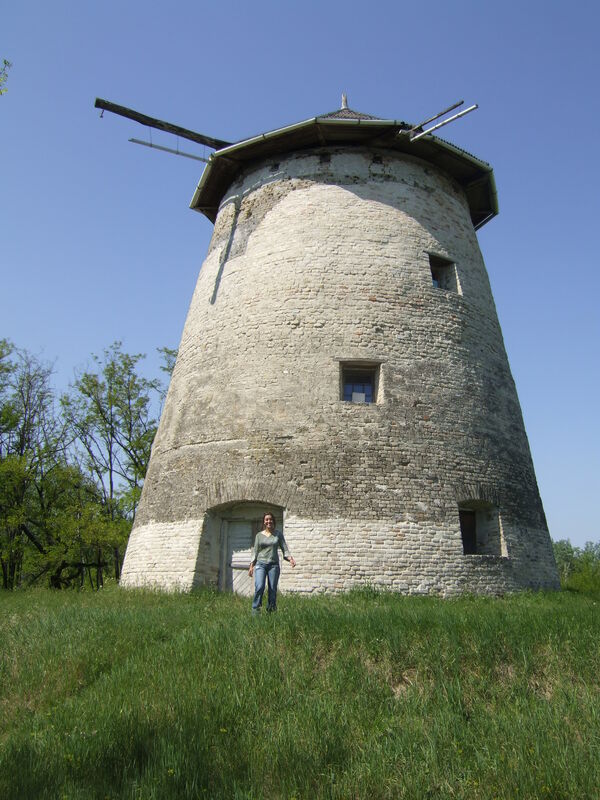 Nathalie gave me a little local tour on our bikes – pass the deer farm to the old mill and then to the monument and we finished off pushing our bikes through the overgrown park. I finally said goodbye just after 12 pm making it my latest start so far. 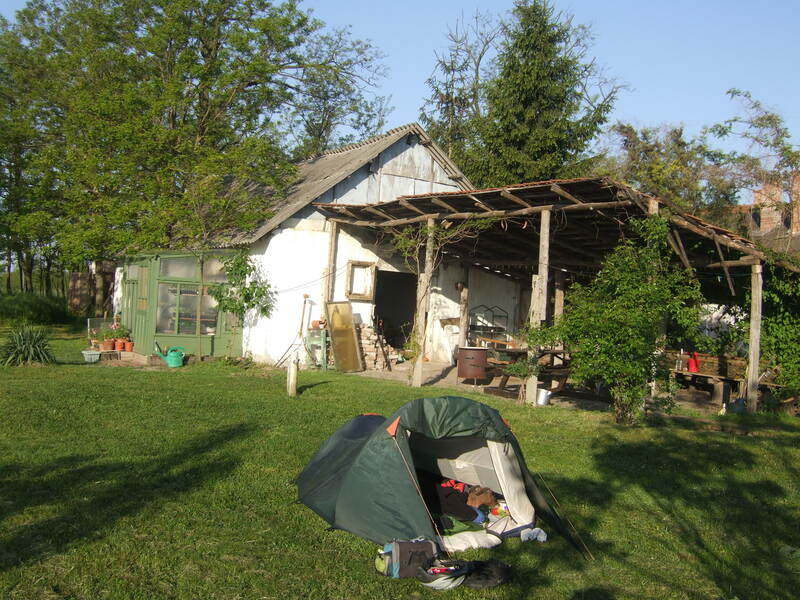 Figured I could still do a 100 km and wild camp some where in Serbia after crossing the border. Got to Szeged about 3:30pm and only 15 km from the border. So I went to the supermarket and spent all my remaining Forints. Come 4:45pm and just a few km short of the border I found a campsite so I figured I would stay in Hungary one more night and turn up at the border fresh tomorrow………….